Systems are everywhere and affect us daily in our private and professional lives. We all use the word “system” to describe something that is essential but often abstract, complex and even mysterious. However, learning to utilize system concepts as first class objects as well as methodologies for systems thinking and systems engineering provides a basis for removing the mystery and moving towards mastery even for complex systems. This journey through the Systems Landscape has been developed to promote learning to “think” and “act” in terms of systems. A unique aspect is the introduction of concrete system semantics provided as a “system survival kit” and based upon a limited number of concepts and principles as well as a mental model called the system-coupling diagram. This discipline independent presentation assists individuals and is essential for building a learning organization that can utilize a systems approach to achieving its enterprise goals. The eight chapters are presented as stops along a journey that successively build system knowledge. Each chapter terminates with a Knowledge Verification section that provides questions and exercises for individuals and groups. Case studies reflecting the utilization of the system related concepts, principles and methodologies are provided as chapter interludes. As posted on Amazon 10 March 2012 (rating 5.0 of 5). We finally have a book on Systems Thinking that a systems engineer can relate to. Harold `Bud` Lawson has written an exceptional book that provides a holistic view of the systems landscape. 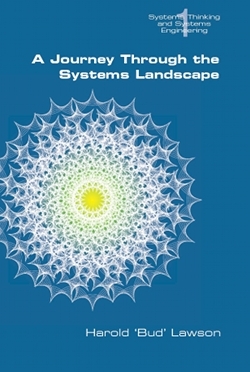 The journey through the systems landscape exposes the paradoxes in the world of system development. The pursuit of solutions in response to problems and opportunities are often conflicted. Narrowly defined boundaries of a system, or problem, result in overly restrictive problem descriptions. Systems' thinking provides a practical framework for thinking outside these restrictive processes and to think and act in a holistic manner that is conscience of the extended system and its implications. Having a comprehensive view of complex system problems and opportunities is the single most important transitional step towards building a learning organization that distinguishes itself from its competitors. We refer to this as systems thinking. Lawson offers a practical rubric for incorporating Systems thinking into the organizational problem solving process. Systems' thinking fosters a holistic approach to problem solving which is attentive to all stakeholder needs that would otherwise go unnoticed and lead to unintended consequences. Lawson reminds the reader that organizations are themselves cybernetic systems. Enterprises use people, process, and tools to solve problems. How well these elements mesh are influenced by many interdependent factors that are easily overlooked and often lead to systematic shortfalls. Lawson provides expert insights into the differences between Data, Information, Knowledge and Wisdom. The reader cannot help but be reminded of war stories where individual knowledge is not automatically understood at the team level. Lawson illustrates how Systems' thinking offers insight into building a learning organization that is equipped to deal with system complexity and the management of information in a changing environment. I give the book an outstanding rating because it gives the reader a comprehensive overview of systems thinking and supporting literature to extend ones understanding of problem solutions and opportunities in the broader context of social systems. First of all I would like to say that Harold 'Bud' Lawson has written an outstanding book on systems thinking and cybernetics in relation to systems in the contexts of social relations. Introducing a lot of different theories within the sphere of systems thinking Lawson puts Systems Thinking into both a practical and theoretical perspective and it works great. The Hard and Soft Systems Methodology. Rich pictures and graphical representation. Feedback loops and knowledge management. Enterprise Architecture and systems thinking. Systems thinking and software design. All of the systems above are important to understand in order to work with tools and concepts that have been based upon systems thinking like enterprise architecture. The book was published in 2010 by College Publications that is an English publisher, and the flow of the book is based primarily on introduction to different perspectives on systems thinking and a couple of cases on how systems thinking have been applied to different situations. As such this isn't that different from the HBSP (Harvard Business School Press) but in the same time it hasn't been focused on interviews with chief executive officers. The book is literally a walk through of the different perspectives of systems thinking but it gives the reader an outstanding overview of what books and articles they should read in order to gain something of an expert insight to systems thinking. The book consists of 274 pages. I have rated the book 7 out of 10 and that is an outstanding rating for a book of this kind. I gave the book a good rating because it gives the reader an outstanding overview of what books and articles to read in order to gain an expert level understanding of systems in a context of social systems. As posted on Amazon 16 September 2013 (rating 5.0 of 5). This is a really interesting book. It describes system concepts in a way that works equally well for systems engineers developing complex technological systems and for nurses using a systems approach to improving patient care. Of many interesting ideas, I would single out the 'system coupling diagram' as being particularly insightful and universally applicable.